You may not be happy with your new president-elect, but you can, at least, enjoy a story about some of the technology that enabled the actual voting process. I’ve said it before and I’m sure I’ll say it again: I love electronic signing. I’m the son of a doctor and one thing I inherited from him, if not my science acumen, was the horrendous nature of my handwriting. I really wish I had nice flowing script like my wife, but after a few words laziness gets to me and my writing ends up looking like chicken scratch. There is also the slightly annoying fact that I have never signed something the same way twice -- my signature is not only an illegible scrawl, but also an ever changing one. Then there is, of course, the hassle of printing out documents, signing them and then scanning them for on-sending -- all a pain that offends my slightly obsessive-compulsive need for simplicity. So, yeah, I’m a fan of electronic signing and always suggest, when people present me with a document to sign, that they try and do it electronically. So, given that I’m a fan of e-signing, I’m always up for a story about how it is being applied to a broader problem space beyond the simple and generally used “help someone sign a documents” use case. A good example is during the recent elections when Vote.org integrated a combination of the HelloSign API and the HelloFax API to make it possible for the first time ever to allow absentee voters to fill out their absentee ballot application online. The HelloSign API made it possible for voters to easily affix their electronic signature to the ballot application directly on Vote.org. Once the ballot application was completed, Vote.org utilized the HelloFax API to automatically fax the ballot application to the appropriate local election office. By integrating the HelloSign and HelloFax APIs, absentee voters in AZ, FL, GA, ID, NE, KS and NC used Vote.org to apply for an absentee ballot entirely online, bypassing the issue of state governments not offering an online alternative. Vote.org utilized the template, data validation and embedded requesting features of the HelloSign API to power a seamless experience for voters to fill out an application for an absentee ballot online. Once the voter inputted their name, birthdate, political party, email address and voting address, the HelloSign API inserted that information into the application form automatically. By utilizing the data validation feature, errors in applications are reduced thanks to the ability to set specific data requirements on each field. The pre-filled application is then ready for the voter to review, affix their electronic signature and submit. Voters are then emailed a copy of their application for their records and the HelloFax API ensures the application is submitted electronically to the correct local elections office. By sending the application to the fax number of that voter’s specific local elections office, the HelloFax API ensures that a hardcopy is available for election officials as deemed necessary by the state government. What I like about this story is that, not just a simple case of “produce document, sign and distribute” this is a far more complex process and one which involves different parts of the vendors overall platform. 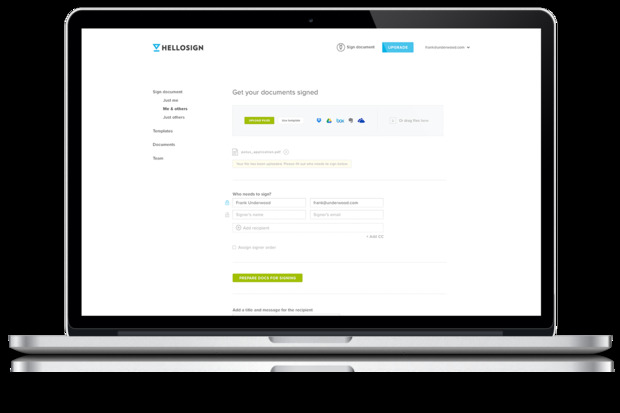 Combining both HelloSign (the e-signing part of the offering) alongside HelloFax (yes, strange to believe but faxing is still a thing), fulfilled a more complex use case. So the election might not have gone the way you would have liked, but at least there’s an interesting tech story that came out of it.